Whether you’re trekking up Machu Picchu, driving along the dreamy Route 66, or backpacking your way across South East Asia, there is one thing you absolutely can’t be without while you’re travelling… GOLD! (or money for the more modern travellers amongst us ). Oh, what a life it would be if travelling was free, but unfortunately for us, it just isn’t the case. In fact, all your travel dreams can come tumbling down if you suddenly find yourself without funds. Whether it’s a misplaced wallet, an overspend or theft, being without the dosh can put a serious dampener on your adventure. So, to make sure you’re in the know about your dough (see what I did there…) I’ve compiled this super handy guide on keeping your money safe while travelling. Take note fellow travellers, I speak from experience after being pick pocketed in Barcelona, misplacing a $100 bill in Vietnam and having a close encounter with one sticky fingered monkey in South Africa (but that’s another story…). Before jetting off, make sure you let your bank know that you will be travelling and to where. This will stop your account from being frozen once you arrive in a destination. Set up a daily withdrawal limit as this will prevent large fraudulent activity if your card is stolen. It will also help you to control personal spending, keeping you within your daily budget – win, win! Make sure you write down the contact details of your bank before you leave home so that you can reach them easily if any problems arise. Keep them somewhere safe, preferably a physical document as relying on technology once you touchdown in foreign lands is not the one. It ‘s wise to give some money to a family member or friend at home before you travel in the event of an emergency. If something happens, they have the cash ready to wire over to you instantly. The bonus with this is that if everything goes to plan, you’ll have some nice savings waiting for you upon your return to the motherland . Try to switch some money over for local currency before you embark upon your adventure. This will avoid issues at the airport if you need to get a bus, train or taxi – transport can already be hard enough to navigate with weary eyes! If prepaid accommodation isn’t arranged, having cash for your first night’s stay is helpful, just in case the smaller, inexpensive hostels don’t have credit card machines. If you do happen to lose your wallet, having a digital copy of your bank card can be an absolute life-saver! Make sure that the photo displays the card number, expiry date, security code and account numbers and you’ll still be able to make purchases online. Apps like ‘Last pass’ are extremely useful to save important documents while travelling, or a good old-fashioned pen and paper can work just as well . You’ve probably been told this one hundreds of times, but it’s SO easy to get distracted and put your backpack down for a minute while chatting to some newly made pals. Rottenly, sometimes a minute is all it takes for something to go wrong so it’s best practice to always have one eye on the prize. Don’t let your goods out of your sight! Another one for the obvious jar – do not leave your wallet in your open handbag or back pocket! It’s super easy to forget your heightened security when you feel so at home in a new country. It’s important to do your research on which areas are known for pickpockets and up your game. Keep handbags on the front of your body, zip up your pockets and don’t advertise your goods! As I already mentioned, it’s useful to have some local currency on you before you travel. For this tip, keep in mind that when it comes to cash, variety is the spice of life! Having an assortment of coins and notes will ensure you’re ready for any occasion: coins for grabbing a gelato, small notes for haggling over harem pants and larger notes at that splash-the-cash, ‘oh-so-instagrammable’ restaurant. Keep hold of some hard currency: Pounds, Euros or Dollars. It can be exchanged at a savvy bureau de change in case your local cash goes missing. Store it with your passport and other important documents and pat yourself on the back when you realise that you’re totally nailing the travel life. Depending on the country you’re travelling in, using a card can be safer than lugging around cash. Luckily, there are many payment methods which you can use while travelling: Apple Pay, Samsung Pay, Paypal and Travel cards like Revolut or WeSwap. 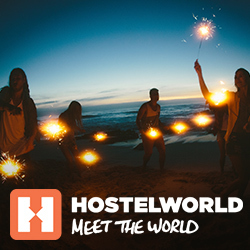 These options make booking hostels, paying for activities and catching the bus that little bit easier. Ensure your phone is secure to prevent unauthorised access to your money and get yourself up to date on the latest payment tech before you go. Top rules of travel school – don’t keep all your money in one place and don’t carry all your cash with you at once! Divide and conquer and just carry the cash you’ll need for each day. Once you’ve got that bit sorted, split up the money you’re carrying with you into different pockets and bags. Leave the rest of your cash behind, locked up in the hostel. The aim of the game is to keep your money as close to your body as possible; somewhere safe, secure and easily accessible to you but not to others. Opinions vary on the best place to store your money – from zipped trouser pockets, money belts and a bra (if you wear one) to your shoes and socks! Whatever floats your boat . Whether you’re staying in a private room or a dorm, it’s important to ensure your money and other valuables are safe. Always use the lockers or safes provided and always bring a spare padlock along (preferably one with a code rather than a key as this eliminates the possibility of a lost key!). If you’re road tripping or camping and travelling to remote locations, you’ll want to make sure that your vehicle is in tip-top safe condition. Don’t hide valuables in obvious areas such as under the seat or in the glove compartment, as these are the first places a thief would look. Instead, use your imagination and treat your items as you would a game of hide-and-seek! Use the multi-stash method, storing money in various locations. Keep your vehicle locked at all times and park in the most secure, well-lit places possible. Locals can spot tourists from a mile off, so don’t be overly flashy with your money and keep your cash out of sight. No matter where you are in the world, pulling out big wads of cash is asking for unwanted attention. Do your research on your travel destination and if crime is a common occurrence, carrying a dummy wallet (an extra wallet with a small amount of cash in it) is a smart decision. Handing over your dummy wallet could save you from physical danger and ensures that your genuine wallet is left untouched. It can be distressing to see people in need. However, it’s best to have your wits about you when it comes to giving money to people on the street. Some could be professional beggars, disguised pickpockets or those just trying to take advantage. Taking your money out can cause unwanted attention so it’s best to look into a more sustainable way to make a difference. You can help the local community by volunteering with charities, which you can organise before you arrive. While you never intend for things to go wrong, it’s important to always have a contingency plan in place. If you do happen to misplace your money, don’t panic. Stay calm, ensure your personal safety and report the issue to the appropriate authority. Remember that at the end of the day, it’s just money. Your safety should always come first. Think logically and plan accordingly. Lost or stolen funds do not necessarily equate to a ruined trip. Don’t let the fear of something going wrong, or one bad experience stop you from enjoying your surroundings and embracing new cultures. Things don’t always go to plan and there are bound to be some hiccups along the way. Be smart, be prepared and nothing will limit your wanderlust. The post Stash Your Cash: How To Keep Your Money Safe While Travelling appeared first on Hostelworld Blog. 10 most haunted hostels to visit this Halloween!